Members of HealthWatch receive our quarterly newsletter by email and access to additional pages of our website (being developed) when logged in. This is a new system to us so if you notice anything wrong or something that could be improved, please contact us. Existing members for whom we had an email address should have received an email from us in June that explained how to set a password and log in. If you have any problems, please contact us. If you are a full-time student, you can subscribe to receive the newsletter by email for free, but you must sign up using your institution email address and enter the date of your graduation (if the day is unknown, enter as the last day of the month). After graduation, you will be invited to continue free membership for a further two years, after which you will be invited to join as paid members. Please also provide your personal email address so we can still contact you after your graduation. Payment can be made using your Paypal account, your credit/debit card or an offline payment by direct bank transfer, cheque, etc. Note that we use PayPal to process credit/debit card payments, but you don't need to have a PayPal account — just select 'Pay with Debit or Credit Card', 'Check Out as a Guest' or 'PayPal Guest Checkout' in PayPal. 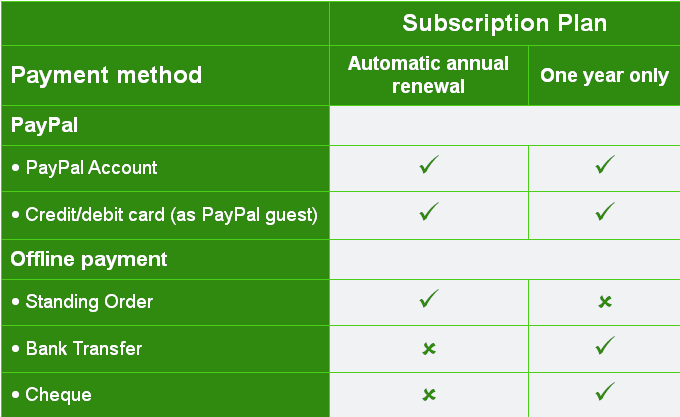 If you choose to pay by Paypal or credit/debit card, your subscription can be renewed automatically — see the membership subscriptions below for details. If you choose to pay offline, we will activate your membership once we have your payment. Full details on how to send your payment are given. 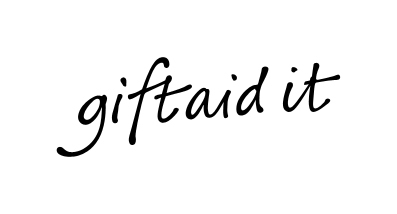 Remember, if you pay UK Income Tax or Capital Gains Tax, you may be able to Gift Aid your subscription and donations. Please see here for further details and remember to click on 'Yes' to Gift Aid when you fill out your subscription form. Please consider including an additional donation with your subscription to help us with our work. You will receive an email once your subscription has been approved. You will also be sent an email so we can verify the email address you gave us. Please click on the link in the email to activate your account. You will then be able to log in to the website. If you don't wish to renew your membership, you can cancel the automatic PayPal payment through your PayPal account or through your bank for a credit or debit card recurring payment. If you cancel your Standing Order at your bank, please let us also know. Your membership will continue until the current expiry date but it will not be renewed. The advancement for the public benefit of medical knowledge, training and care in all its branches and, in particular, the development of good practices in the assessment and testing of treatments and the conduct of clinical trials generally and the promotion of high standards of health care by practitioners. Membership of HealthWatch does not imply any kind of accreditation or endorsement. If you have any difficulties subscribing, would like to change membership subscription (eg from receiving the newsletter by post to by email) or have any questions, please contact the Membership Secretary. Please remember to keep your membership details up to date. Your subscription will be renewed automatically each year, but you will be informed of this beforehand. We will send you a reminder to renew your subscription each year just before your subscription ends. Until graduation and you must provide your institution email address and give your date of graduation. After graduation, you will be invited to continue free membership for a further two years, after which you will be invited to join as paid members.